Preheat oven to 375F. Grease a shallow 2 1/2-quart baking dish. In a medium saucepan, bring 1 3/4 cups water to a boil. Stir in rice, cover, reduce heat and simmer until all water is absorbed, 20 to 25 minutes. Pour coconut milk on top. Cover with wax paper; let rest for 30 minutes. Meanwhile, spread coconut in a single layer on a baking sheet and toast in oven, stirring frequently, until golden brown, 7 to 10 minutes. 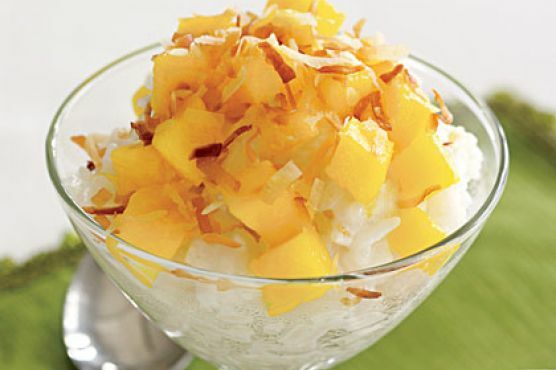 Rice Pudding can be paired with Cream Sherry, Port, and Moscato d'Asti. A common wine pairing rule is to make sure your wine is sweeter than your food. Delicate desserts go well with Moscato d'Asti, nutty desserts with cream sherry, and caramel or chocolate desserts pair well with port.